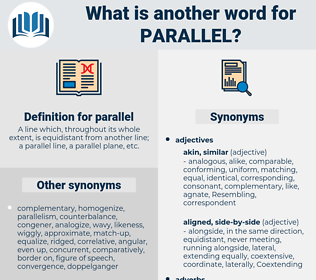 What is another word for parallel? A line which, throughout its whole extent, is equidistant from another line; a parallel line, a parallel plane, etc. be the very picture of. alternate, similar, corresponding, concurrently, simultaneously, comparable, analogous, informal, twin-track, equivalent, dual, horizontal, commensurate, accompanying, twin, concomitant, contemporaneous, underground, collateral, unparalleled, Flanking, related. tandem, randomness, analogy, equivalent, comparison, companion, concomitant, collateral, counterpart. concurrently, simultaneously, similarly, correspondingly, together, apart, Concomitantly, along. relates, compares, represents, refers, reflects, responds, denotes, fits, meets. unalike, unequal, unrelated, unlike, inconsistent. dissimilar, zigzag, separate, divergent, skewed, different, crooked. inaccurate, inexact, unconnected, noninterchangeable, imprecise, Oblique-angled, varied, various, varying, asynchronous, variable, nonequivalent. dissimilarity, difference, reverse, opposite, divergence, unlikeness. distort, skew, imbalance, diverge, refuse, disagree, differ. Spain agreed to withdraw her troops from all her posts north of the parallel of 31 degrees. You perceive we are following them in a parallel course. check, gibe, tally, match, correspond, jibe, agree, fit.